Jun. 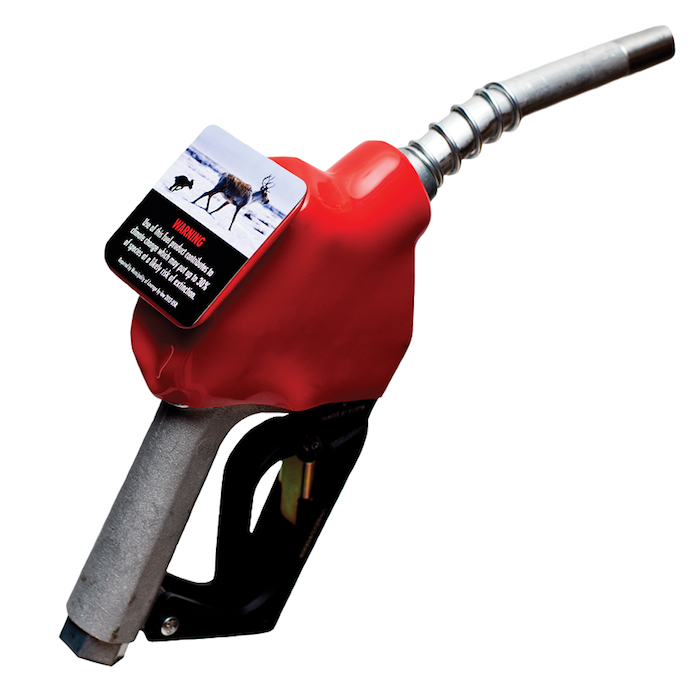 22, 2015 5:00 p.m.
An advocacy group and a growing number of municipal politicians are pushing for the addition of climate change warning labels on gas pump handles. The pain drivers feel at the pump from high gas prices may soon also come with a jolt of shame for helping destroy the planet. A proposal gaining momentum with civic leaders in B.C. would see guilt-inducing climate change warning labels slapped on all gas pump handles. The non-profit group Our Horizon has been advancing the concept on the basis that warnings that graphically show the damage from climate change could nudge motorists to cut their emissions. It’s inspired by cigarette package warnings that are credited in the decline of smoking and the example warning labels circulated by the group are similar in design. “Warning: Use of this fuel product contributes to ocean acidification which puts much marine life at risk of extinction,” states one label that comes with images of thriving and dead coral. West Vancouver council will bring a resolution before the Union of B.C. Municipalities in September asking the province to make the pump labels a requirement province-wide. City of North Vancouver council voted to endorse the idea June 15 and it doesn’t want to wait for a provincial government decision. Our Horizon B.C. campaigner Matt Hulse said he believes any municipality could make gas pump labeling a condition for gas stations in its local business licence bylaw. But West Vancouver Mayor Mike Smith, a longtime petroleum distributor in the region, said he doesn’t want to take the risk that a unilateral municipal requirement gets challenged in court. “I personally hate spending public money on legal fees,” he said, adding his city will wait for provincial policy. Smith said he will vote in favour of his council’s resolution at UBCM. He called the suggested labels innocuous and doesn’t believe the oil industry would object. No jurisdiction in Canada has yet made pump warning labels a requirement. Hulse said the labels would help make the routine act of filling up the tank a choice to be considered more carefully. “It places responsibility right in the palm of your hand,” Hulse said. If the concept takes off, he said, specific impact wording and imagery could be developed to tailor the labels to each area. Richmond Coun. Harold Steves noted handle labels would only be seen by self-serve pump users and suggested larger labels for the pump display be designed that are visible at full-serve stations. SFU marketing professor Lindsay Meredith said the idea could influence fossil fuel consumption, particularly among people already considering buying an electric car or choosing other transportation options to reduce their carbon footprint.